First let me say that I have done my best to care for this hydrangea but have failed. I underwatered and it wilted. 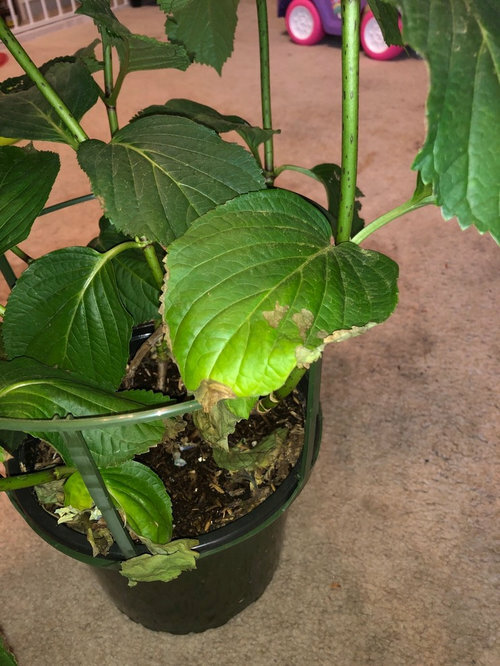 I put it outside in a somewhat shady area but it got too much sun and shriveled up and is now crunchy. 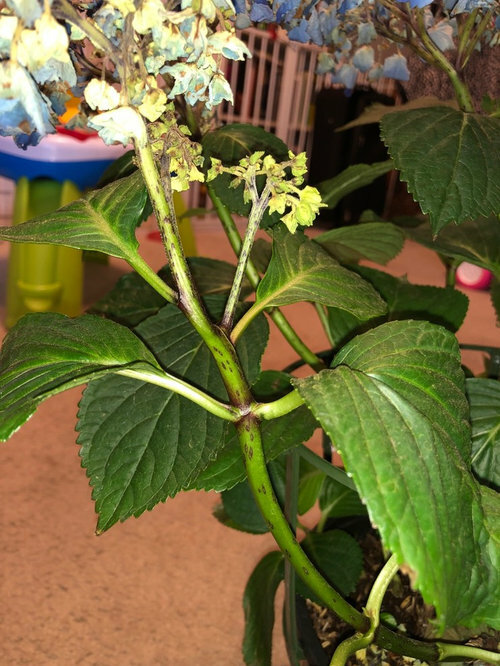 There are dark spots on the stems. I'm not sure what they are from. 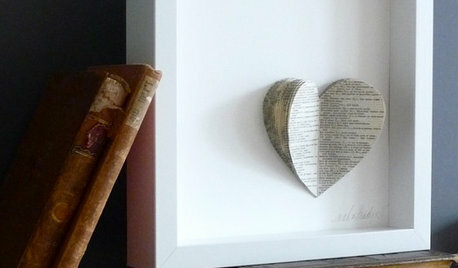 I've been reading quite a lot on how to care for them. They are inside now, sitting next to a window that gets morning sun and shade in the afternoon. I also have a curtain I can cover the window with if it's too sunny. The pot doesn't feel heavy when I lift it. The soil feels wet and there is no water draining out the bottom. 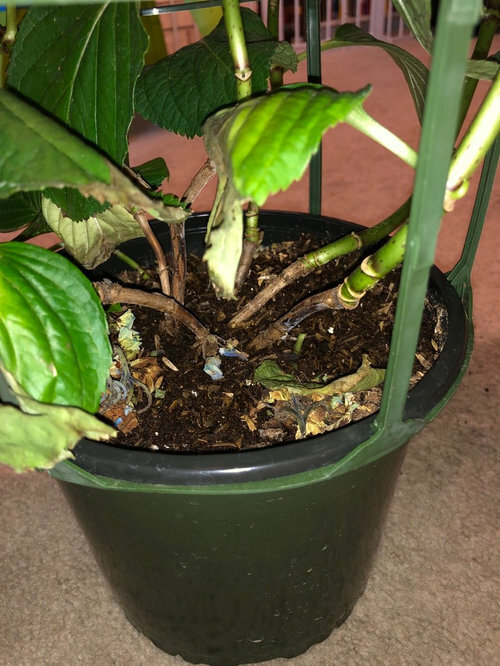 I was thinking maybe some kind of pest has gotten to it and reading about that made me think I should prune it, if that is the case. what zone are you in ? The plant got stressed out a bit , the good news is its still actually doing ok though. No, you shouldn't prune other than deadheading the spent flowers. Also, hydrangeas don't do well as houseplants, so you should be looking to get it outside either in the ground or in a container. I googled my zone and it looks like I'm in zone 7a. Tulsa, Oklahoma. Are the dark spots on the stems normal? Some things I read said it could be normal and others said it could be an infection from anthracnose. I checked the root ball last night. The bottom was quite dry. So I gave them a soak for a little over an hour. I pruned the small blooms that were super crunchy. I did not go past the first set of two leaves under the blooms because I wasn't really sure where the new buds were at. I would like to keep them mostly in the house because I know I would kill them if I had them planted. The weather here is so unpredictable. On nice days I would definitely put them outside. I want to transfer them into a bigger pot though. Any suggestions on what kind of pot and the best way to do it? 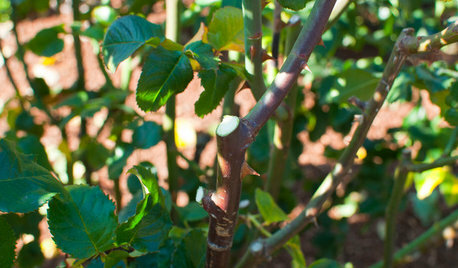 Black spots on stems are lenticles and are perfectly normal. As the stems age and become more woody (like those at the base of the plant) the lenticels disappear. And they are more pronounced on some varieties than others. 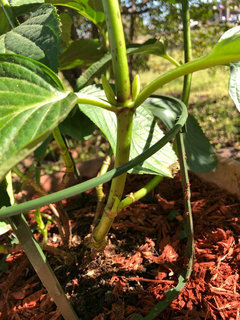 Here comes the bad news.......:-( Your hydrangea looks bad because it is inside. Hydrangeas are NOT houseplants and dislike indoor conditions. It is typically too dark, too dry and with too even temperatures inside a house for them to ever thrive....they certainly will not rebloom if kept indoors. Those sold in flower at this time of year are greenhouse grown, artifically forced into bloom and intended as temporary or disposable flowering gift plants. If you want it to survive long term, it must be planted outside! If it is now above freezing at night in your zone, you can start to transition the plant to the outdoors. Keep it in shade until it is able to stay out round the clock and then plant it in a location that receives only morning sun but plenty of afternoon shade. And you can clip off the old flower heads right above the next set of leaves. They are drawing on energy the plant can barely muster at this stage so get rid of them. That is all the pruning that needs to be or should be done. Shayla, you have two choices. 1. keep it as a house plant and kill it. 2. Plant it out side and give it a chance to live. It should be very happy planted in the ground in zone 7 - but please read GG advice as to garden location. One major thing we learn as successful gardeners is that it is not what you want - it is what the plant wants and needs to survive. Give your little hydrangea a chance to grow in your garden and you will be rewarded for years of beauty and lovely blossoms. I can't help but be curious about why you think you'd kill this landscape shrub by planting it outside? 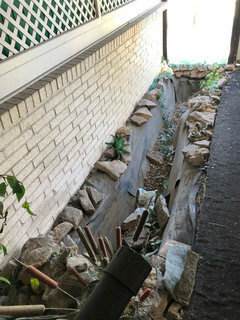 Is there something about your outdoor yard environment that we don't know about? Perhaps we can help. I don't think it would survive because there are really no shady areas in my yard. We have no trees. I'm also afraid I would forget about it because I don't go outside often. 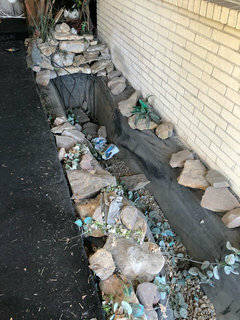 I have an enclosed porch with a fake pond that is just full of rocks. 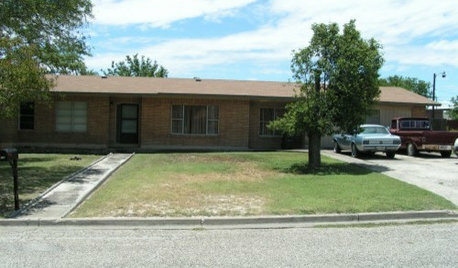 I was thinking of filling it and making a little flower bed to plant the hydrangea and an azalea shub I have. The porch gets decent sun and obviously shade, considering it's enclosed. The pond is 12' x 2' x 2'. Would that be an option? I did not purchase these plants and really have no idea what I'm doing. I have them because my mother received them and she has no where to plant them or any desire to even have them. I took them hoping I could do right by them. I want to do what's best for the plant not what I want. I'm just scared I'm going to mess it all up. Shayla, take a deep breath. If this was a gift, think of them as cut flowers. 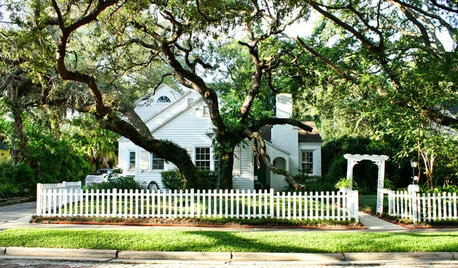 If you have no shade in your garden you can try to use the porch. The trick here is to have the temp of the air the same as the outside. 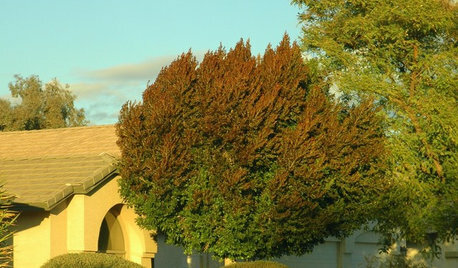 It is important for some plants to have a difference in temp from day to night. Try the plant in the porch and see how it does. 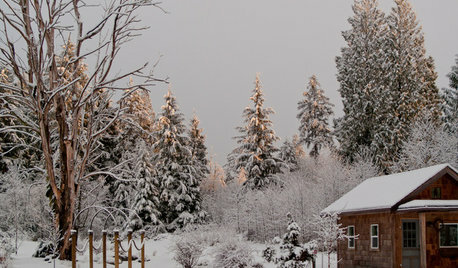 In Seattle today there is a difference between night and day - 43 F night and 58 F daytime. These swings are necessary for the plant to survive and are far more extreme as we approach late spring and summer. 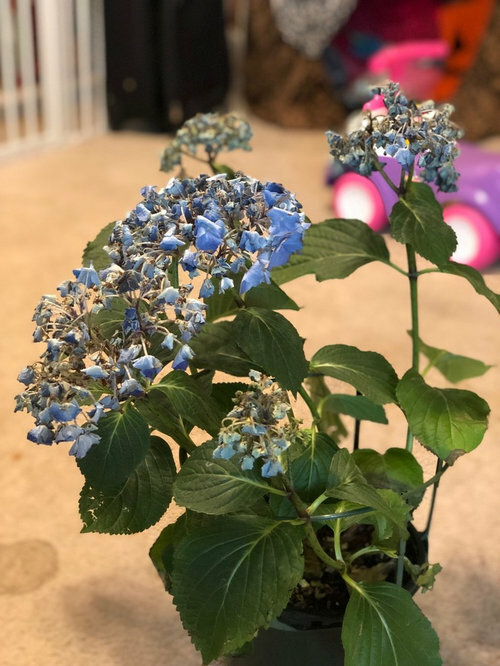 If your little pool has a plastic tub, then you are going to drown the hydrangea and any other plant that you plant in it - they have to have drainage. 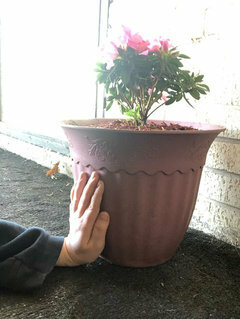 If it were my plant I would tap it out of the plastic container, put some holes in the bottom and put it on a saucer so you can see the water come out of the bottom when it is watered. Toss the water in the bottom after a couple of hours and then leave it alone for a few days. When the soil is dry on the top inch or so - give it a drink until it runs out the bottom. I don't have a drill so I heat a nail or piece of metal on my gas stove top and melt the holes - it works. At least 5 or 6 holes should do it. What ever happens to your plant you are learning some good ways to garden and you can always find a friend or neighbor with shade in their garden and give them the plant. For now I'm transplanting into a bigger pot until I have the funds to fill the pond. It doesn't have a plastic tub in it, just some kind of tarp. I watched a lot of videos on how to make a raised bed, which can't be much different than this pond right? Anyways I'm planning to replace the tarp with landscaping fabric, leave the rocks, add some broken clay pot pieces, some random soil (just as a filler), and the rest potting mix and a little mulch. I'm only stressing about this because I hate to see it whither away because I'm so clueless. I am feeling lots more confident now though. My father-in-law and I were talking today about all this and he thinks it could work if there is enough sun and I think there will be. 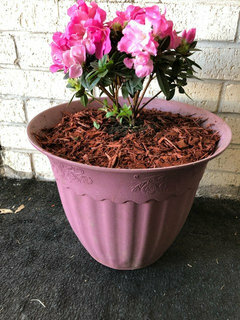 He gave me a few large plastic pots, top soil (I don't really know the difference in all the soils), and some red mulch so I can go ahead and move them over. I've always wanted to have nice flowers and plants to grow and care for but have never had the chance or motivation until now. I hope it goes well and if not, at least I can say I did my very best. I'll just have to keep learning and get more experience, since I have 0. Lol. Your house will create shade. So go outside several times during a day that you are home and just walk all the way around the building and notice where there is shade and at what time of day. Your hydrangea will likely be happy where there is either little direct sun such as on the north side of your home or on the east side where it gets morning sun only. 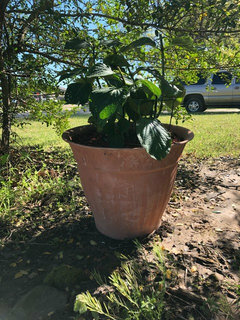 Plant about 3’ from the building, water well, and mulch with bark mulch. Water when there hasn’t been rain. 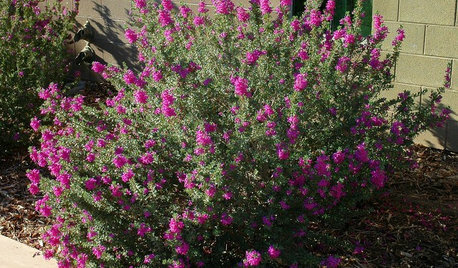 The flowers will likely turn pink in your soil. I think the azalea will need to be in a large pot because I doubt your outside soil will suit it. I think a large pot would be easier than trying to use the pond as a planter, though if you post a photo of the pond, I may feel different. Don’t stress out too much if the plants don’t work out over the long term. They were gifts and intended as similar to long lasting cut flowers, to be tossed when done blooming. Kudos to you for trying to keep them alive and learning about what they need to survive longer term. This is the pond. The window at the end of it is on the north side and there's a window to the right on the east side. Found a little sunny/shady area on the north side of my house. Wondering if this pots big enough? Also this guy is growing. 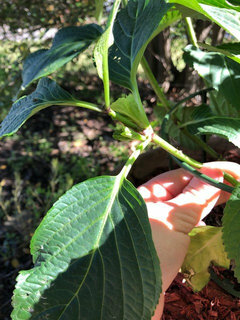 There is a little branch growing from the bottom and is now showing leaves and the already established branches have buds that I can actually see. None of this was there before so I'm doing something right, right? Lol. Sure its big enough. Now just sit back and see what happens. If it doesn't do well I wouldn't stress out too much. 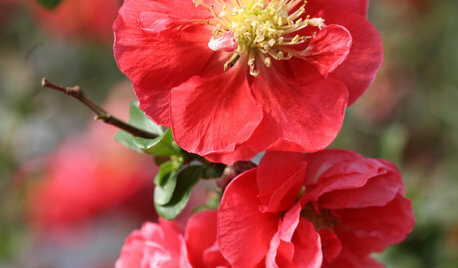 Gift plants are generally treated like cut flowers meant to be enjoyed for awhile until they go out of bloom. 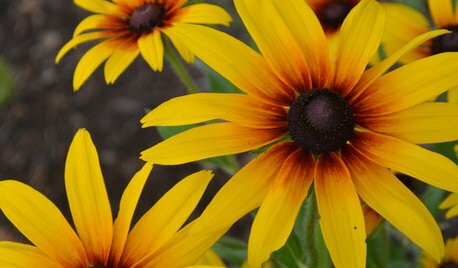 Lots of very good advice from experienced gardeners - thanks all! Tony Advent, founder and owner of Plants Delight Nursery, https://www.plantdelights.com/ plant expert and fabulous speaker- says 'If you haven't killed it three times, you haven't tried to grow it!" We have all killed plants in our gardens! lol I don't say that I killed it but that it 'croaked.' 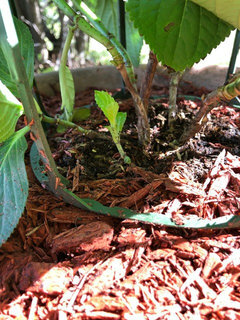 Your plant looks great and the new growth will be stronger than the parts grown under hot house conditions. can the ficus be saved? 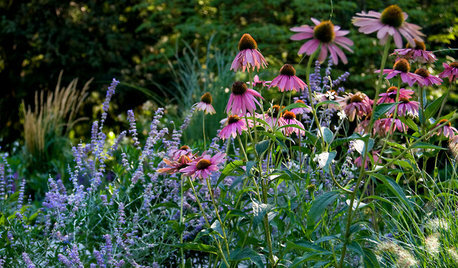 What are you hoping to add to your garden?